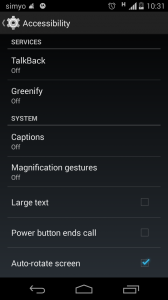 Accessibility is one of the strengths of Android. Being an open system, many developers have been working with the aim of helping people with vision impairments to use their smartphones and make all the functionalities available to them. In the Accessibility section of the “Settings” menu you can set some options, such as activate magnification gestures or large text. However, the most important application that can be activated is TalkBack. TalkBack is a screen reader developed by Eyes Free Project, in collaboration with Google. It is an application designed for people with vision problems of any level, so that thay can use all the smartphone’s functions autonomously. Once activated, the application describes by voice the elements selected when we drag our finger across the screen, thus helping us to navigate through the different menu options and applications. It also creates direct access to different phone functions with simple gestures. For example, moving the finger up and left, we can access directly to the desktop. These gestural shortcuts can be configured from the TalkBack’s Settings menu. In many models it comes installed by default, although some companies don’t include it. 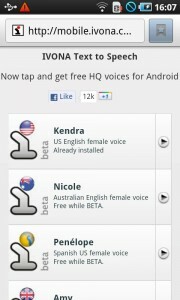 In this case, you can download TalkBack for free from the Play Store. There are several synthesis speech engines that allow us to enter text from the voice. Most devices carry Google TTS by default. It is the most widespread, but not the one with the highest quality. In general, the most valued is the Samsung TTS, although not all devices have it. Another good option is Ivona TTS, owned by Amazon, although we must take into account that this speech engine consumes many system resources, so it may not work well on low-middle range devices.